Pasta Puttanesca, with Tuna, Thyme for Cooking pasta. A simple pasta with Mediterranean flavors. Tuna is not a traditional ingredient, but it makes a more substantial main course for our way of eating. In Italy, this would be served without tuna, as a pasta course. Chop onion, pepper and mince garlic. Drain tomatoes (do not reserve liquid) and roughly chop. Heat oil in medium nonstick skillet. Add onion, pepper, garlic and chili powder. Sauté until onion is tender. 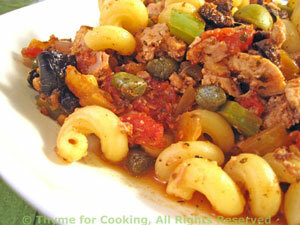 Add chopped tomatoes with their juices from chopping, capers, olives and herbs. Simmer, uncovered until thick, about 10 minutes. Drain and flake tuna. Add to sauce and simmer 5 minutes longer. Drain pasta, toss with sauce and serve.